Workrite Pinnacle 2 is the latest generation of the highly acclaimed PinnacleArm. With an easy-read TiltRite gauge and full-range tilt support, the Pinnacle 2 keyboard arm offers unprecedented smoothness and adjustability for maximum comfort. 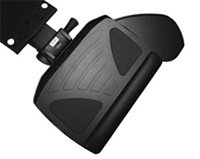 For the most versatile solution, select a platform with an integrated ambidextrous mousing surface. Two popular choices include the Banana-Board, with its sliding mouse surface or Revo, with its quick change mouse tray. 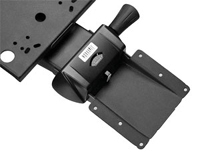 Superior Tilt Range - Pinnacle 2 offers full range positive and negative tilt with a single arm to accommodate the optimal position for different needs. Pinnacle 2 Extended offers height adjustment range up to 8 inches below the work surface to meet the BIFMA standard G1-2001. Easy-Read Visual - The Pinnacle 2 tilt gauge is conveniently located on the top of the arm for easy viewing. Adjustable Dual Spring Assist - The dual counterbalance lift assist spring is preset at the factory for optimal performance. However, with the unique combination of adjustability and dual springs, the Pinnacle 2 enables users to adjust the spring to accommodate most keyboard platforms. Easy Adjustability - Workrite was the first to develop incremental tilt capability that does not effect height adjustment or require a tightening or clamping knob. With particular focus on employee comfort and convenience, Pinnacle 2 features an incremental tilt that is adjustable by simply rotating the knob to increase or decrease to the recommended tilt angle. This helps to maintain a straight wrist position for employees with a repetitive strain injury such as carpal tunnel syndrome (CTS). 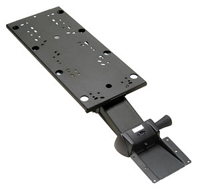 Durability - All Workrite Pinnacle 2 adjustable keyboard arms meet or exceed the ANSI/BIFMA X5.5-1998 standards for performance, durability, and cycle testing. All Pinnacle 2 products carry a Limited Lifetime Warranty. 16-13/16" track length for desks deeper than 17". a = 26" ... b =15" ... c = 1 1/2"